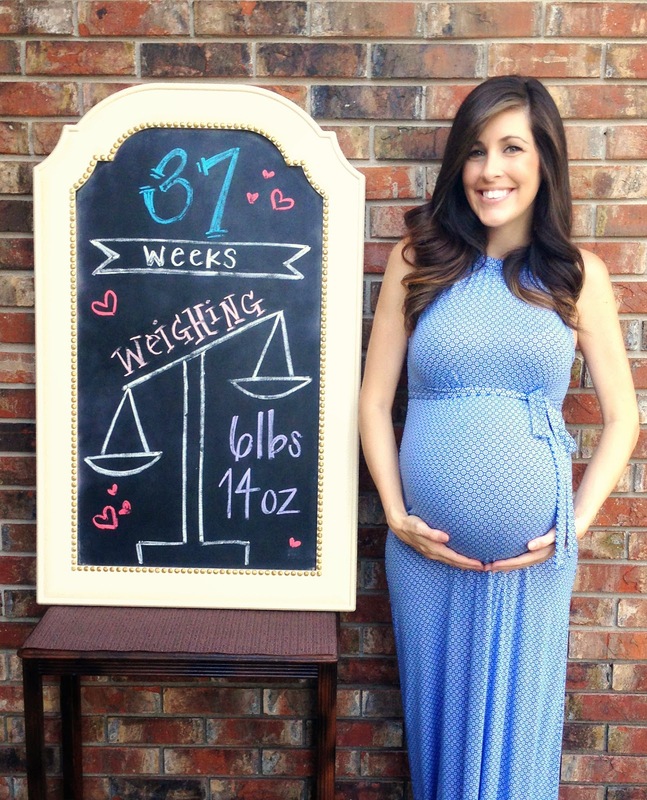 37 weeks?! Wow. My little gummy bear has grown into a full fledged baby ready for the real world! Crazy, right?! I still find myself teetering between super ready and scared out of my mind … all normal feelings I suppose. I’m just so anxious to meet our little girl and the reality of not knowing when or how it’s going to happen drives me batty. Though I’m still as uncomfortable as ever, the weeks seem to be going by surprisingly quick. We had our 37 week appointment yesterday that started with an Ultrasound. It only took one quick wave of the wand to figure out why the last few weeks have been filled with incredible discomfort … Little Miss has officially run out of womb. (Corny, I know … but I couldn’t resist.) This Momma’s petite frame has reached max capacity and has no available real estate left for this little lady to rent. Everywhere the tech looked was some part of the baby making it really hard to get any good pictures to share. She is packed in there like a little sardine. I did get to confirm that bulge constantly seen poking from my right side that is bullying my ribs and lungs is indeed her foot. Not only her foot, but her heel that she is not too shy to use to jab things in her way … ultrasound wand included. By the looks of it … and I think my lungs and ribs would agree, I’m pretty certain she got her dad’s big feet and not Momma’s sweet little size 5 1/2’s. We did manage to catch a quick glimpse of her face revealing the cutest little nose and chubby cheeks. 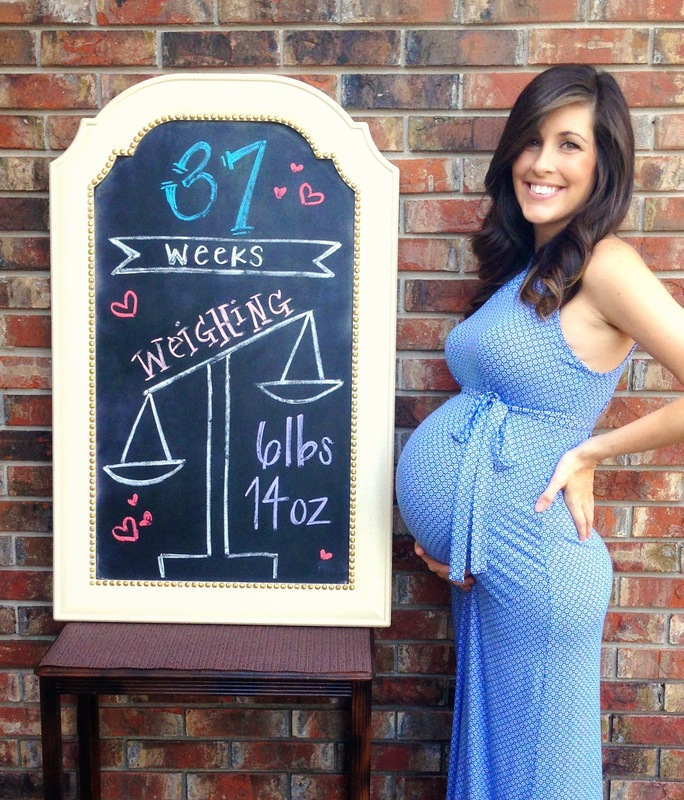 Though this Momma is petite, baby girl does not seem to be lacking in the weight department. She is filling out quite nicely and weighing in at 6lbs 14oz, give or take a little bit. I’m still gaining weight by the day and Doc says she is taking every last pound that I gain. He giggled and deemed me “All Baby!” I think we were all quite surprised she didn’t measure smaller. He also confirmed that she is head down and ready for action … so now we wait! Ahhh! Extra treat this week … View from the front! Total weight gain? I got up to 33lbs, but weighed in at a 30lb weight gain at the Doctor. Maternity clothes? I literally have like 5 outfits that fit me right now. Stretch marks? No, and I might cry if they show up now … but I’m still not ruling it out. PEAK of the week? Seeing baby girl one last time before we meet her! Also, my changing pad cover FINALLY shipped after being back-ordered for the second time! Now maybe I can actually get this nursery done before she gets here. PIT of the week? Seeing her on screen was great, but I was a little disappointed we couldn’t get any good shots for keepsakes of her last ultrasound. Miss anything? Me. This baby has officially taken over my body and I’m just ready for some sense of normalcy … and being able to wear more than 5 outfits would be nice. Movement? With nowhere left to go this little lady manages to rock this belly all over the place. Food cravings? Food. Just food. On Tuesday all I did was eat … everything. I could’ve eaten a cardboard box and been a happy camper. I do have a slight obsession with Chips Ahoy Mini’s and managed to kill an entire bag in two sittings. Anything making you feel sick or queasy? Sometimes the Braxton Hicks can get a little intense and make me a little nauseous but other than that I’m doing good in this department. Symptoms? Still swelling. My feet and ankles have been aching more lately too. In addition to my feet, I’m finding that I often have to take off my wedding rings due to swelling. I’m trying so hard to keep them on since I’ve made it this far, but I have a feeling I’ll have to retire them soon. Also, Braxton Hicks, hunger, emotions, and nesting. Belly button in or out? So flat it’s almost non-existent. I don’t think this thing is going to pop. Happy or moody? I’m all over the place. Nuts is a more accurate description. I can cry, laugh, and get mad all in the same breath. Milestones? Seeing our baby girl one last time and getting a rough estimate on her weight. We are also all registered at the hospital so we don’t have to worry about anything once we go into labor. Looking forward to? Meeting baby girl, of course! But first, I would love to finish that dang nursery! We have our next doctors appointments on the same day! Your symptoms seem a lot like mine at the moment. Swelling, mood is EVERYWHERE, deemed "all baby" by our doctors, eating everything in sight and we've even gained the same amount of weight haha. You look amazing though (as usual)! I wish my doctors would give me an ultrasound but they don't do that unless it's "absolutely necessary" and every time I go in there they basically tell me I'm perfectly healthy and they will see me next week. UGH haha. I hope we get to meet our baby's soon though! Lol nesting NEVER makes sense! I nested by scrubbing carpet…that Ashlynn would not need to crawl on for several months…in a house I knew we would be moving from before she crawled. But the dog slept there and it HAD to be cleaned!! I can't wait to see pictures when she is born!!! Ahh I am so jealous you got to get one last ultrasound. Part of me wants to schedule one just so I can get one last glimpse before she appears. But it seems silly to pay $65 knowing she will be here is 17 short days! (Give or take!) I wonder which one of us is going to go first? It's been so fun to have a birthday partner with you! Thank you! We weren't supposed to get an ultrasound this late in the game but our Doctor was nice enough to sneak one in for us. It's nice to know I'm not alone in the symptom department! Crazy how pregnancy makes you feel this close to labor! Can't wait until we are all updating our blogs with pictures of our precious babies! So soon!